The Reverbalizer is a hackable electronic multieffects module for mobile and microcontroller applications. It is hackable in two ways. First, you can adapt it for use in a microcontroller project. Second, you can download or create additional DSP effects and install it on an EEPROM cartridge using an Arduino-based program we developed. It comes with 8 effects in ROM and 8 on the re-programmable cartridge. The Reverbalizer uses the FV-1 DSP chip from Spin Semiconductor. The chip was designed by Alesis founder Keith Barr and appears in many ambienbuy effects units like the Z-DSP. 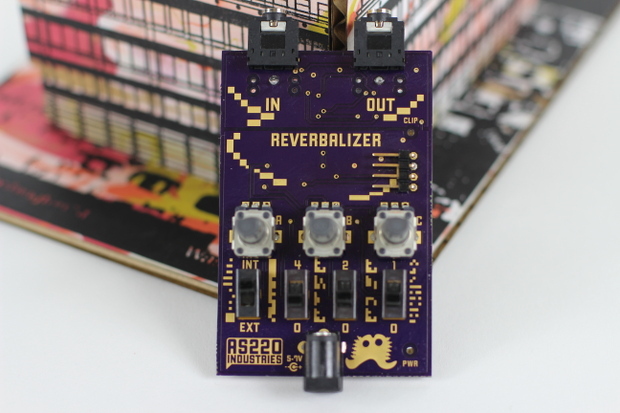 For now the Reverbalizer is only available through the AS220 Industries Annual Fundwocky on Indiegogo, but will be a permanent catalog item in the future.